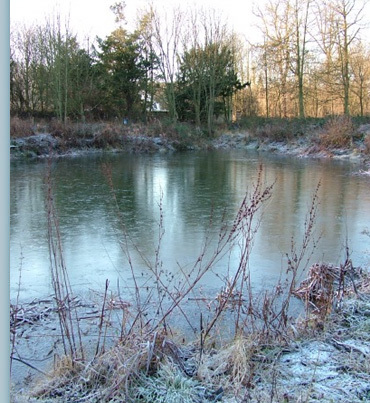 The header image shows the fishpond at a moment when its capacity was at bursting point following some heavy rainfall. The source of the pond is the larger Gamekeeper's lake adjacent to the cottage of that name on the south side of Parlington Lane, in turn the source of the Gamekeeper's lake is a spring further down the Fly line in the Bathingwell Plantation. (A self explanatory description of the earlier use of the spring water!) A photo here at the head of the page shows a horse drawn water bowser, quite probably with water from the Bathingwell spring at one of the Staithe cottages on Parlington Lane in the 1930's. 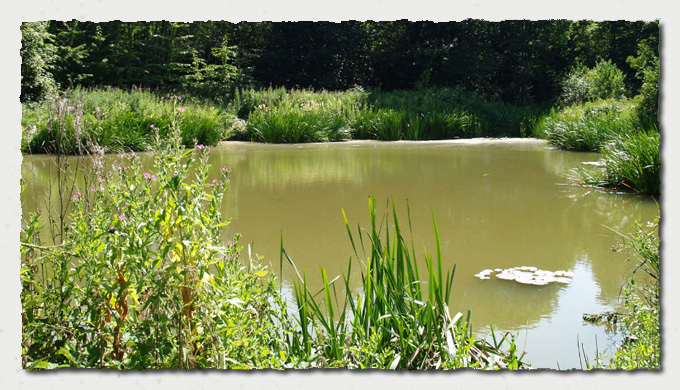 The pond was a prominent feature in the Parlington garden and was accessed by a series of gravel footpaths which criss-crossed the landscape, affording a veritable pleasure walk for the residents of the Hall and any visitors. It also had an important function as the source of the ice in the winter months for the underground ice house about a quarter of a mile away to the east. Moreover it is said that the lake became a private skating rink during the hard winters of the eighteenth and nineteenth centuries, a fact not corroborated in any way, but worth a mention if only to contrast the difference in winter temperatures we experience today. 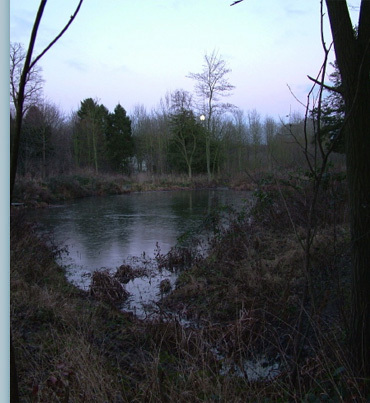 The pictures above and below were taken on Boxing Day 2004, a thin skin of ice was evident, but soon thawed with the rise of the sun. In the centre of the image on the far bank is the stream from the larger lake. The use of the pond as a recreational feature for the family lends me to suggest a view of times gone by Historical humorous pictures here. Click Refresh to change the image in the pop-up.